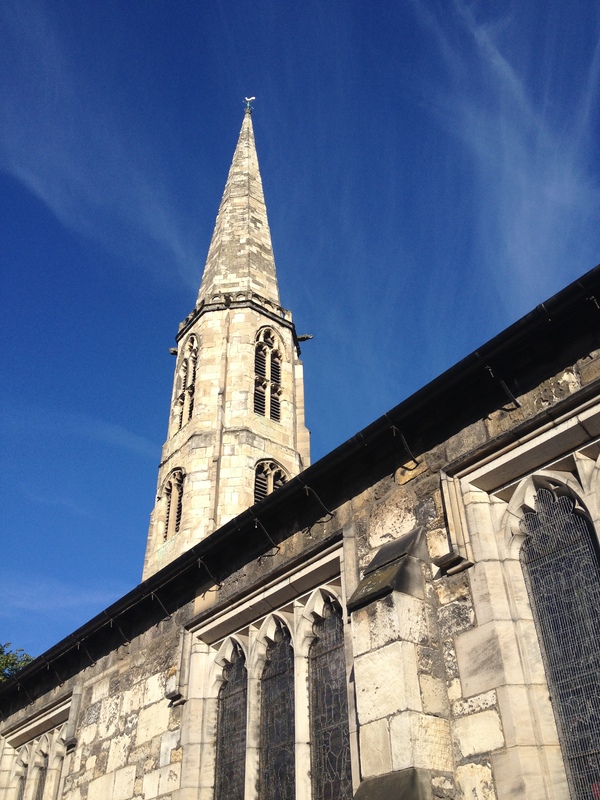 August training weekend at All Saints, North Street. Getting away from work and family commitments for a week’s digging can prove very tricky for a lot of people. 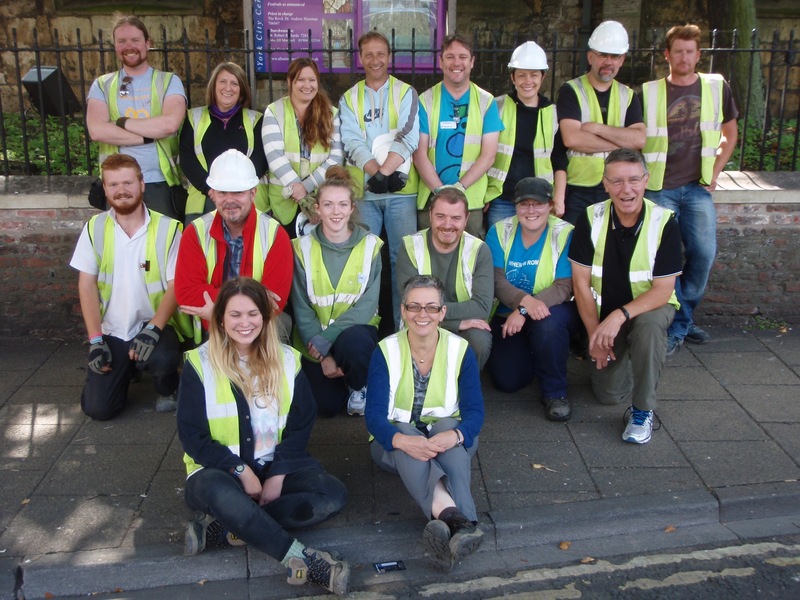 Thankfully, our training weekends are proving to be an increasingly popular alternative for archaeology enthusiasts with busy lives. The second weekend dig of the 2014 season saw the team digging in some glorious sunshine and making some intriguing discoveries. Stepping back into the ‘That End’ hot seat for the weekend, Arran set his new team straight to work on a number of features. 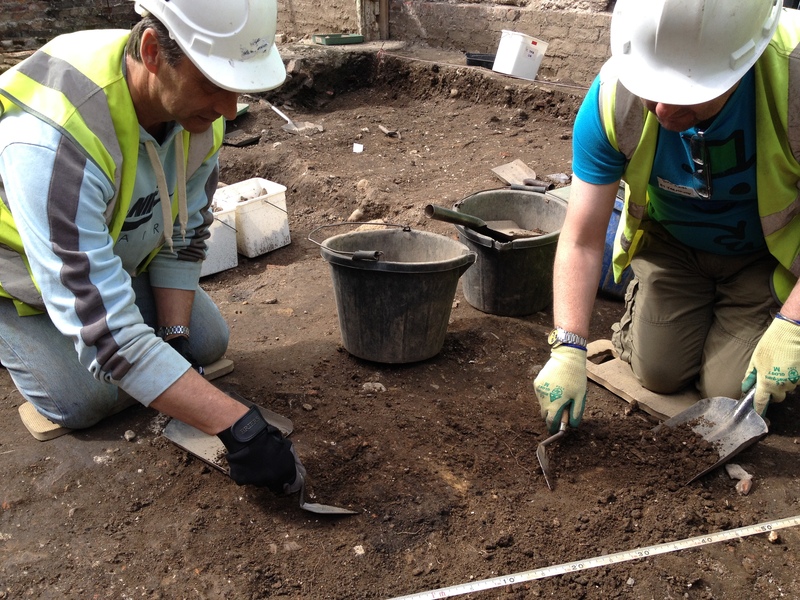 Darren and Gregers troweled over a large area to clarify some difficult edges. In doing so, the pair uncovered a small dump of mixed material. 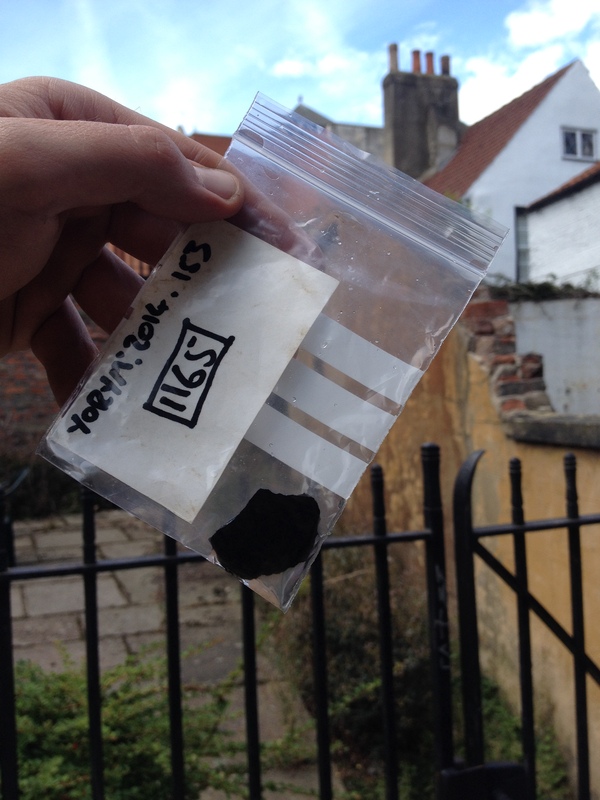 Proving to be another deposit relating to the area’s busy early 19th century life as a working yard space, the context produced some great finds. 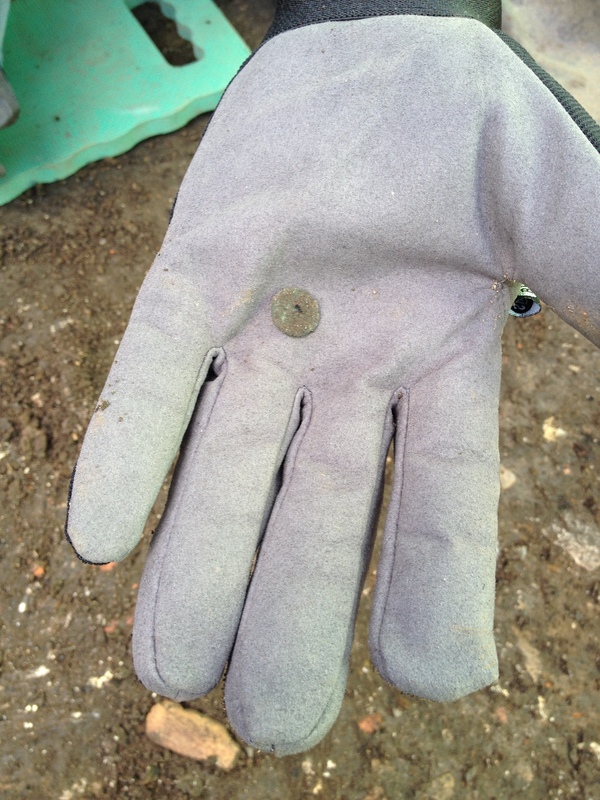 In fact, it took Gregers all of five minutes to uncover this rather lovely coin! Gregers’ coin, fresh out of the ground. Being highly corroded, a precise date will remain uncertain until it is cleaned by our conservators. 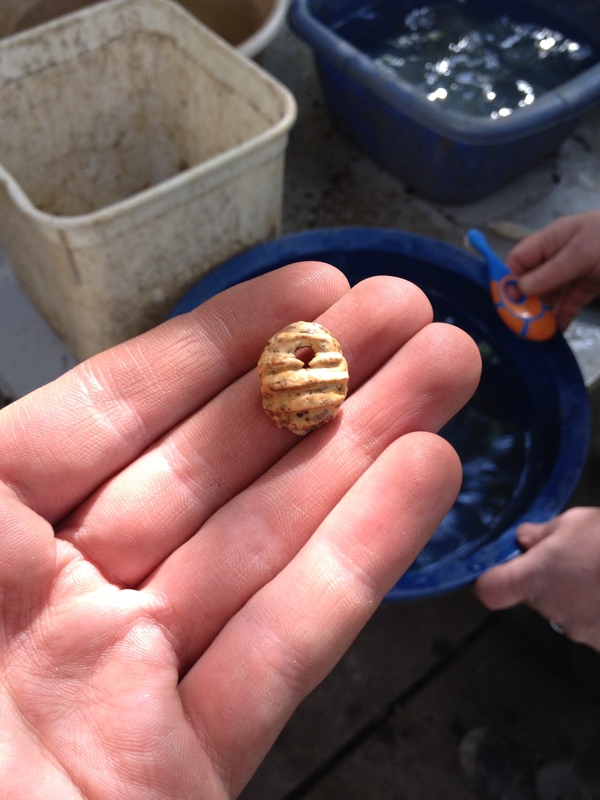 However, judging by its size and appearance, a Roman date seems the most likely. Regardless, Gregers was off to a great start and suitably happy with his work! Gregers shows off his find. With their dump fully recorded and excavated, Gregers and Darren cleaned up a small patch of darker soil. This deposit proved to be the backfill of a post hole, one of an increasing number of structural features in the area. The post hole proved to be relatively shallow, seemingly effected by later clearance events. Nonetheless, when all the contemporary structural elements are viewed together, we may be able to build a clearer picture of what kind of transient structures were in use here at the beginning of the 19th century. Dave and Tracey took on the tricky task of working in ‘contrary corner’. They began their week by continuing work on a pit backfill that was started in week 9. The trench basking in the afternoon sun. 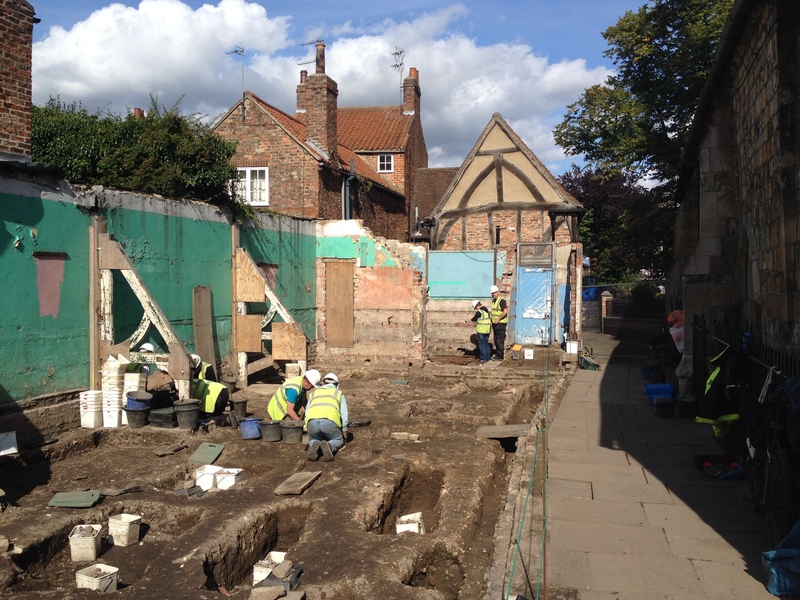 Contrary Corner occupies the northern end of the trench, overlooked by 14th century cottages. The pit backfill contained pottery ranging in date from Roman to 19th century, appearing to represent disposal of domestic waste. Whether this waste would have come from the nearby rectory or All Saints Cottages is hard to say, although some high status ceramics were certainly present. 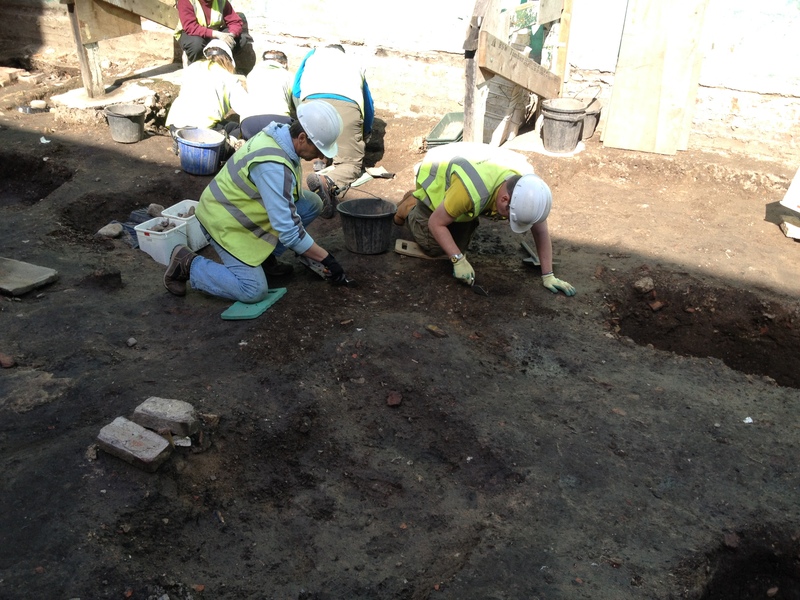 Dave and Tracey begin excavating their pit backfill. The pit truncated a number of earlier features, including a cobble surface and perhaps most importantly, an infant burial. 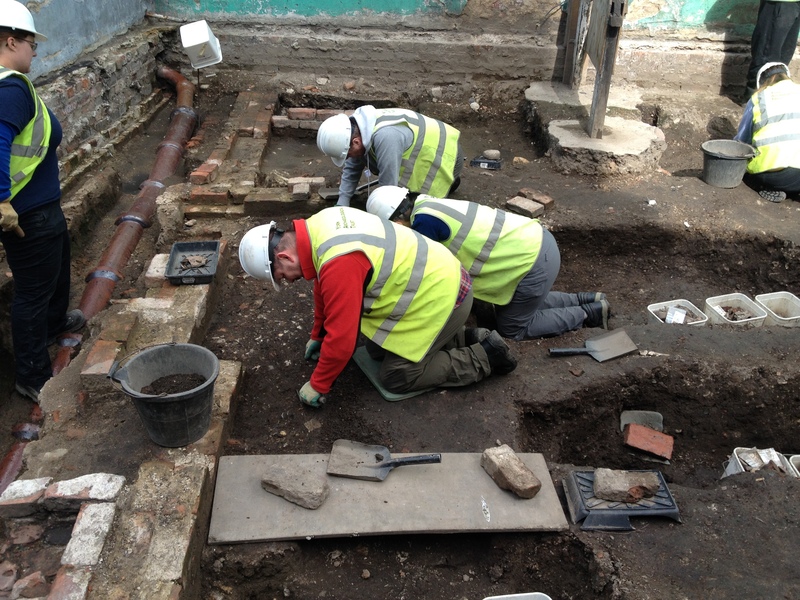 As we know that the site began receiving burials only after 1823 and that the pit pre-dates the 1860s construction of the Church Hall, we can quite tightly date this feature. Dave and Tracey’s pit after excavation. 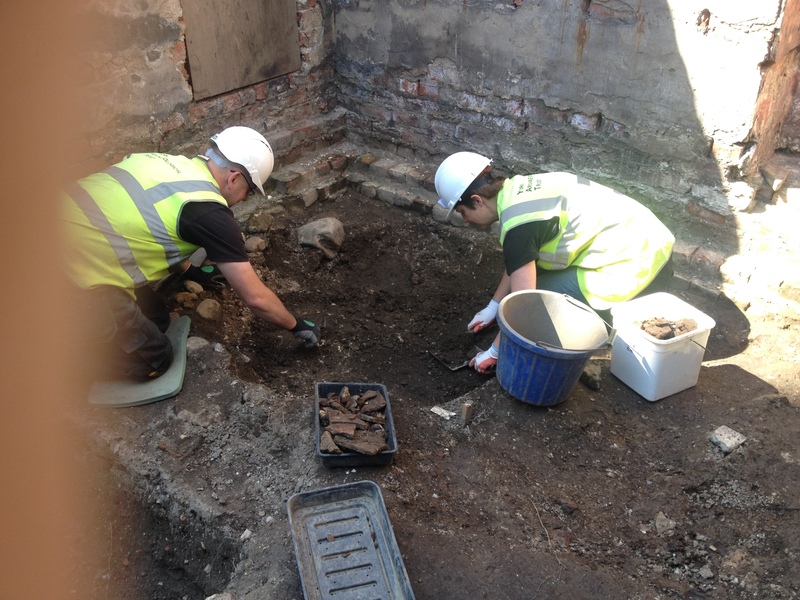 With the pit fully recorded, Dave and Tracey turned their attention to the opposite end of ‘contrary corner’ and discovered, recorded and excavated a second refuse pit. Finally, it seems that this difficult end of the trench is beginning to yield clear features with a little less resistance! 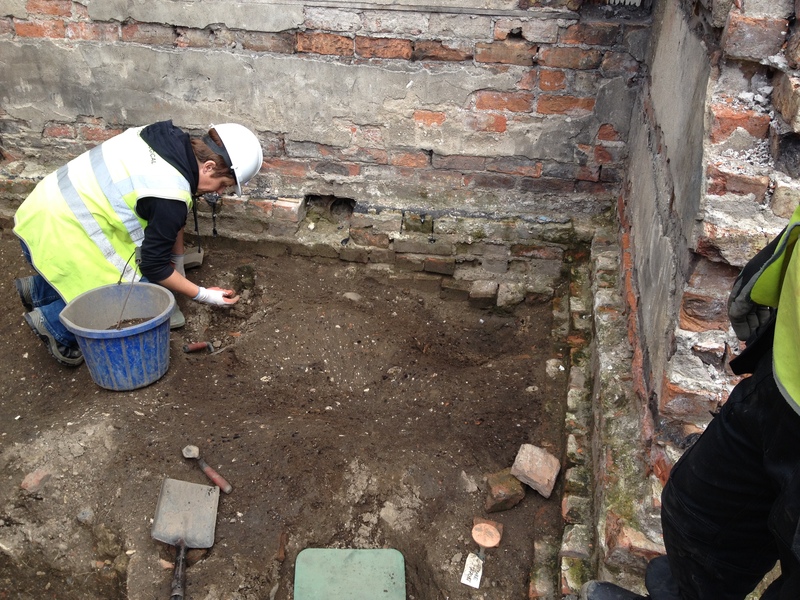 Tracey cleaning her pit backfill, a lighter circle of soil can be seen to the right of her trowel. Sally and Amanda began their weekend in an area where no clear edges were appearing. A diligent troweling session was needed to define the extents of a dump of clayey material. This pre-dates the early 19th century phase of burials, most likely being deposited in the first decade of the 1800s. Gus runs Sally and Amanda through the finer points of planning. 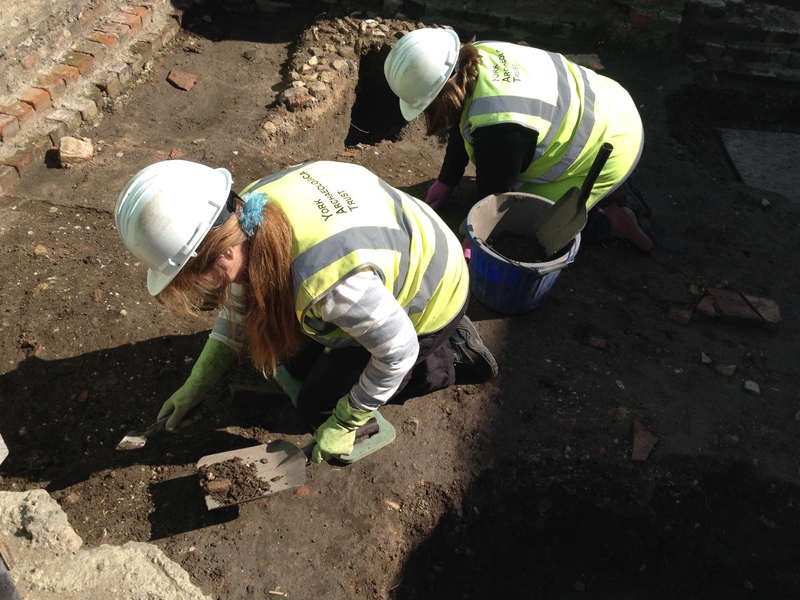 With their context fully excavated, Sally and Amanda resumed their hunt for new edges and cleaned up a number of deposits. This process gave us a much clearer view of the sequence at this (well, that) end of the trench and will put us in good stead for next week! Toby’s team were also faced with some tricky trowelling. Niamh, John, Lottie, Diane, Harvey and David rotated through a number of tasks over the weekend. One of the bigger jobs was the removal of a dump deposit at the north-west edge of the trench. 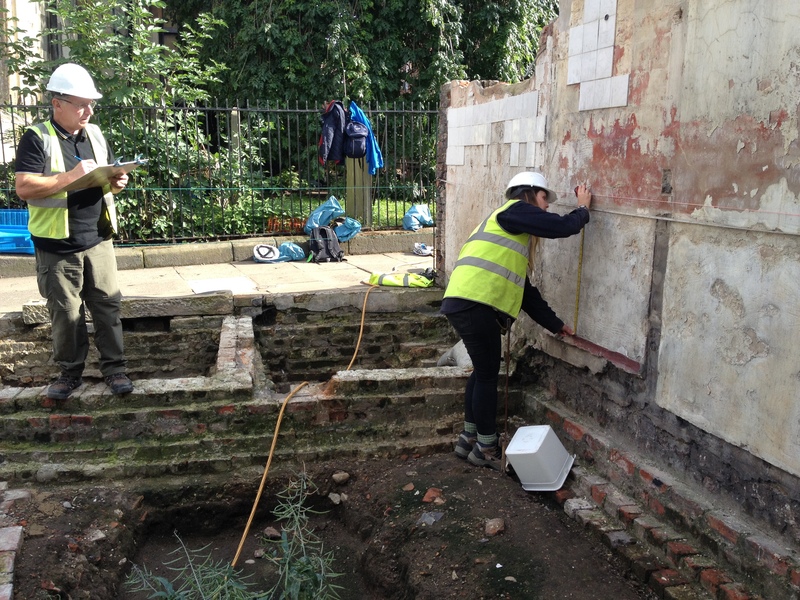 This process revealed the backfill of a post hole which was cleaned and photographed. It also exposed a possible grave backfill, although this will be investigated next week. Troweling next to the rectory wall. Interestingly, the 18th century rectory wall still has no visible construction cut. This means that the deposits that lie next to the wall are still later in date. 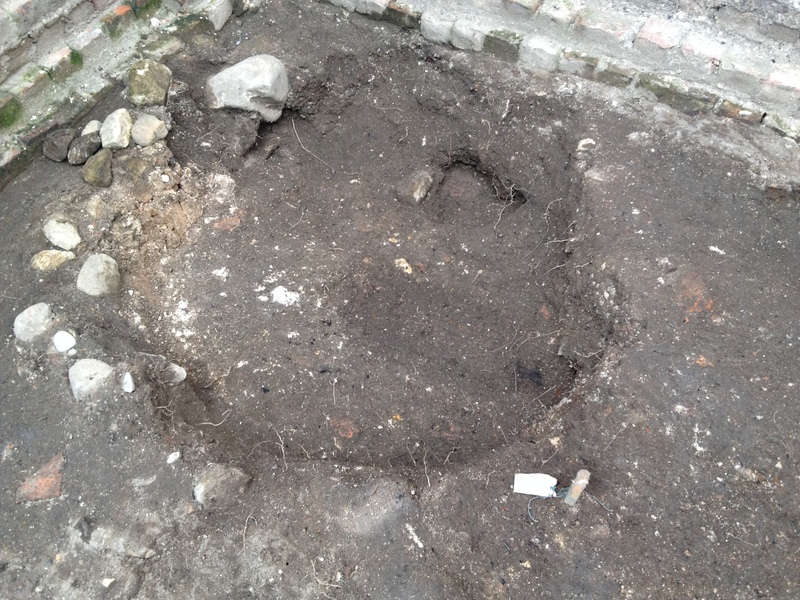 This area was cleaned up to try and clarify this situation, revealing a very mixed deposit that was rich in mortar. It is possible that this deposit is the result of fairly intensive grave digging. Toby’s team continue work on a grave backfill. 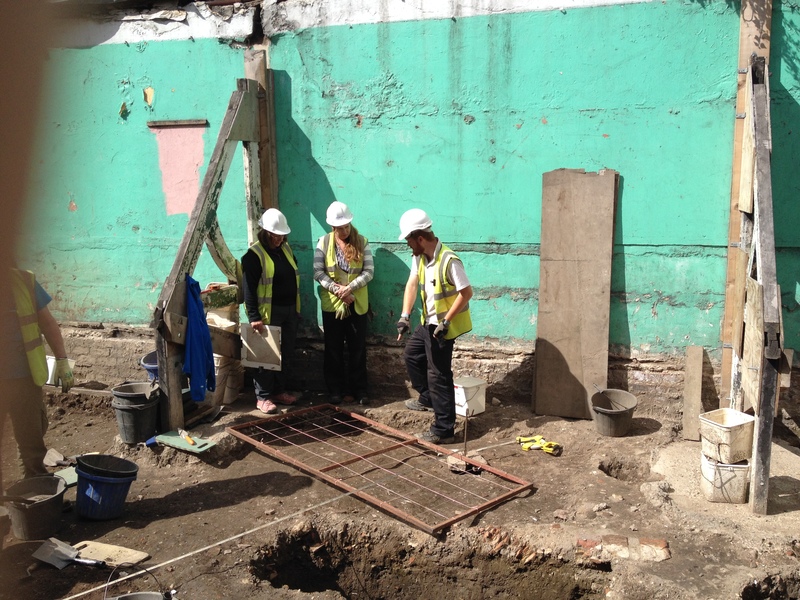 As Toby’s team grew increasingly confident with their troweling, they picked up the excavation of one of our partially dug grave backfills. Working at a suitably steady pace, the team were able to clarify the edges of an increasingly complex, inter-cutting sequence. Under the gaze of Planty the Plant, the ‘This End’ team learned that archaeology isn’t all underground, as they began to record the walls of the old church hall. Meticulous measurements led to some very handsome elevation drawings that reveal the walls to be something of a palimpsest, with numerous alterations. Recording begins on the upstanding building remains. Under the shade of the Finds Tree, some fascinating artefacts were cleaned up, including an unusual sherd of Roman colour coat pottery in the form of a mortarium. 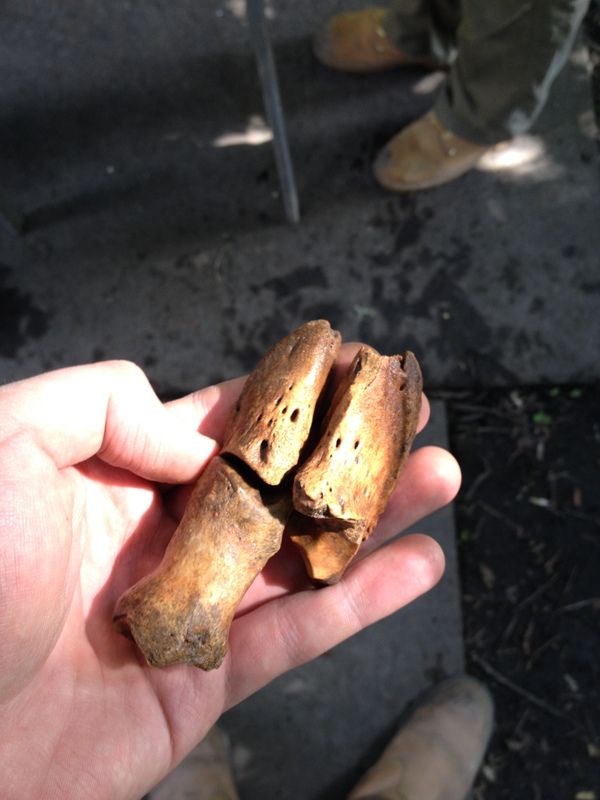 Washing finds from a context rich in animal bone, the team enjoyed an impromptu faunal remains session and were able to re-construct parts of several cows. We have the technology, we can re-build moo. Seafood was clearly popular at All Saints. 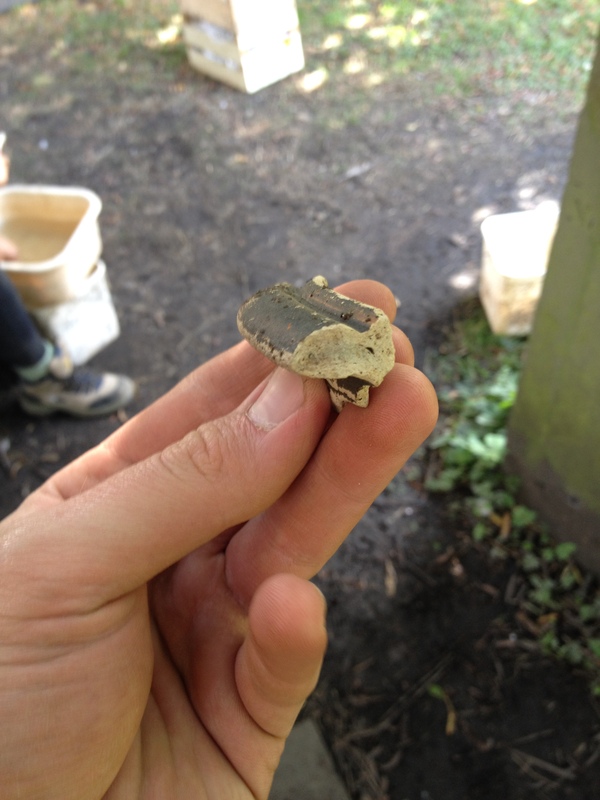 One of the weekend’s best finds was a fragment of medieval stained glass. Now barely even translucent, it is intriguing to wonder which window this once occupied! 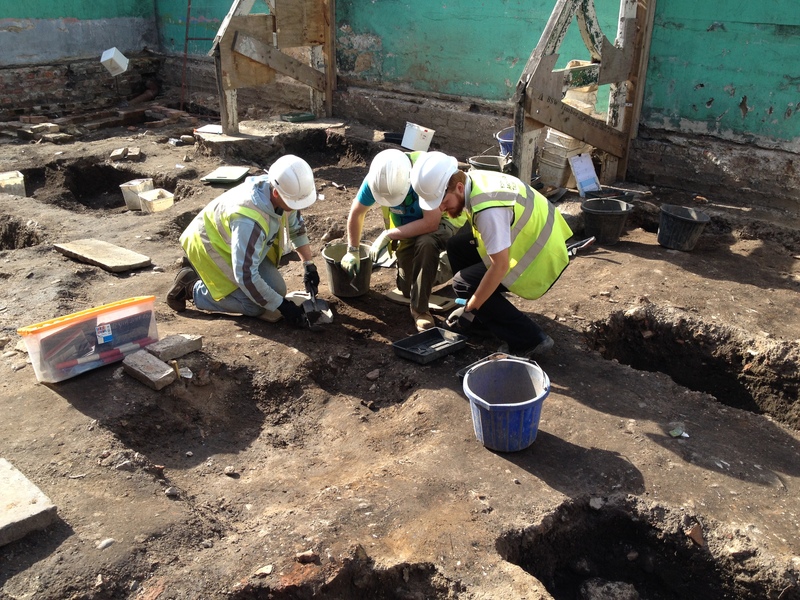 The weekend closed with a guided tour of the site and a summary of the latest findings. 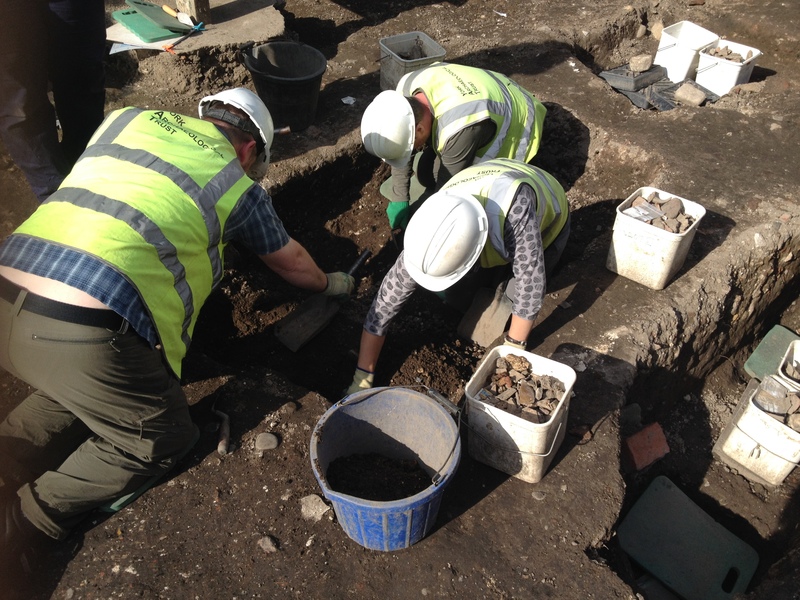 There is a lot to fit in to two days, but this proved to be a vintage training weekend, with new deposits being discovered and excavated and new ideas being brought up regarding the early 19th century use of the site. Gregers’ coin was an obvious highlight amidst some great finds, with a high occurrence of unusual and high status ceramics. 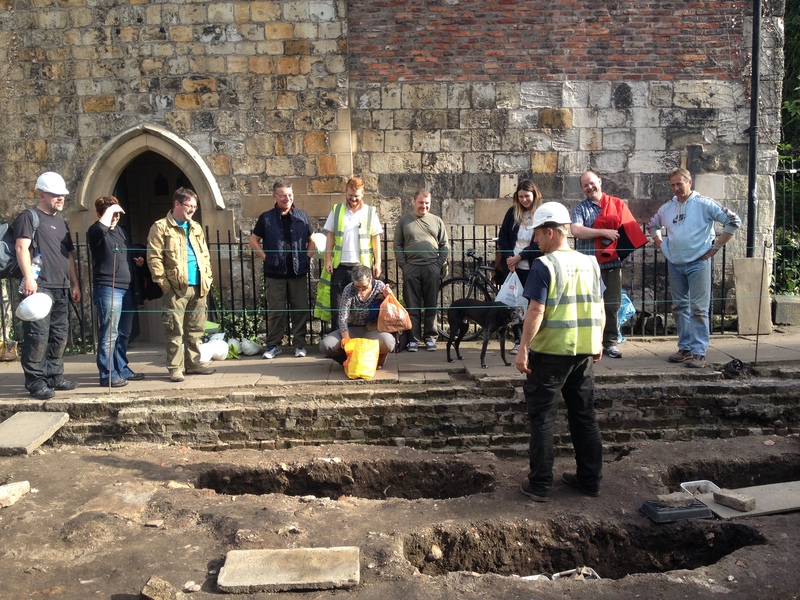 On Sunday, we were also joined by a VIP guest and Archaeology Live! legend – Harry! Harry dropped by on the off chance someone had some spare ham. 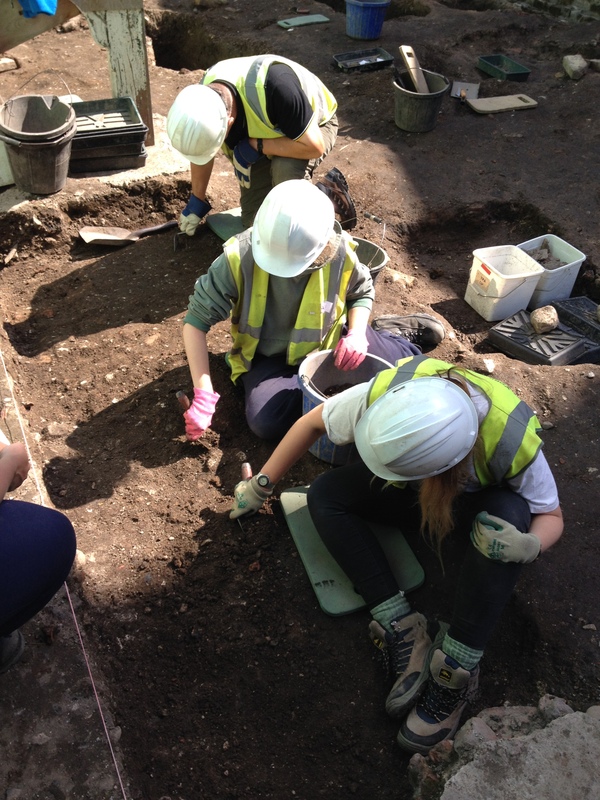 Many thanks to the weekend team for a fascinating and fun two day dig! Great work by all and good to see a mix of new and familiar faces. 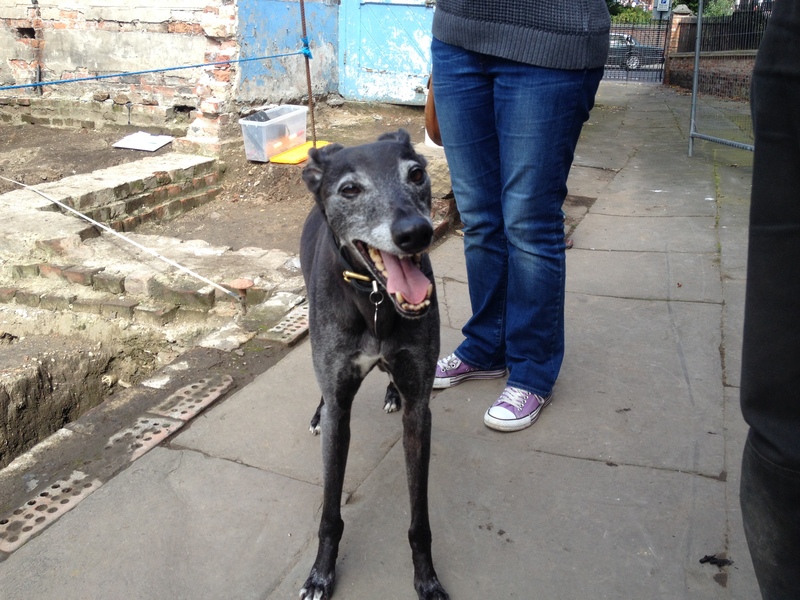 Toby’s end of week wrap-up. 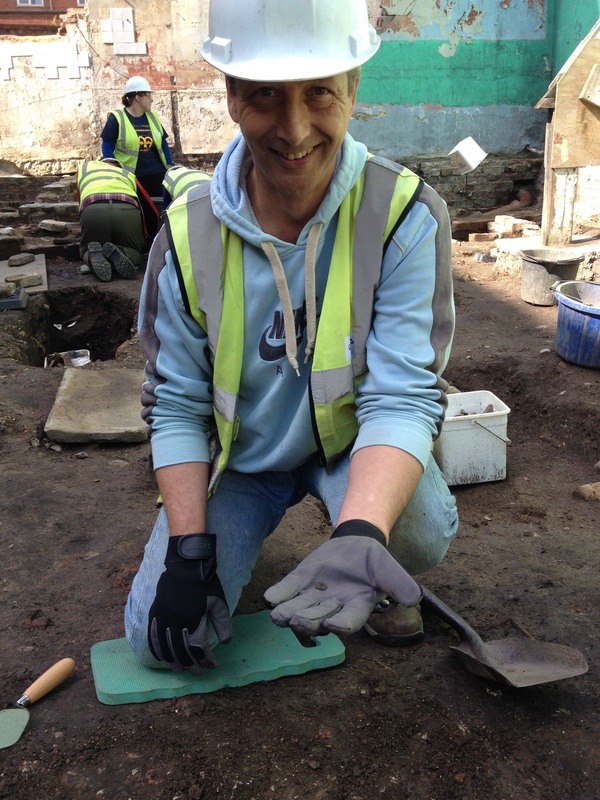 With only three weeks to go, there is a lot of archaeology still to play with! The increasingly autumnal weather may attempt to play a part, but on the strength of this season so far, I think we’ll have a stellar end to the summer dig! 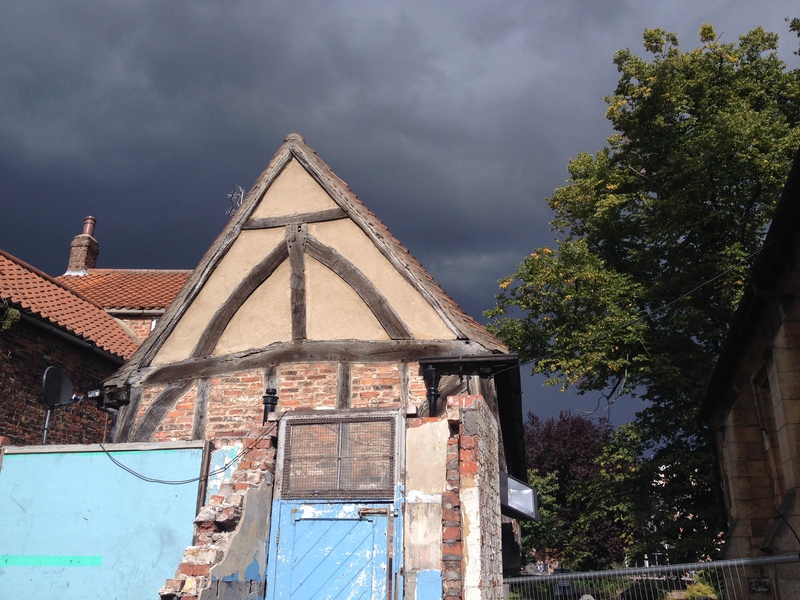 Ominous skies over All Saints Cottages. Archaeology Live! Summer 2014. Week 9. Archaeology Live! Summer 2014. Week 10.